Hortus Camdenensis | Achimenes pedunculata Benth. Rhizomatous perennial with a rangy habit and green or purplish stems to 90cm long, leaves heart-shaped at the base, often with a purplish lower surface, and axillary peduncles of 2 nodding flowers, usually towards the ends of the stems, with a vermilion red corolla tube with an orange flush below and a yellow throat, all dotted with dark red. [Moore, GRA p.33]. According to the British Florist introduced to Britain in 1840. [BF p.156/1844]. It was figured in Edwards’ Botanical Register: ‘The shady woods of Santa Maria, in Guatemala, produced this fine species for Mr. Hartweg, who forwarded it to the Horticultural Society. It flowered for the first time in September 1841. In appearance it is more like a Gesnera than an Achimenes, but, if the limits assigned to these genera by DeCandolle are the true ones, Mr. Bentham has rightly placed it in Achimenes. For it has a cup-shaped disk and distinct anthers which appear to be among the most important attributes of the latter genus. 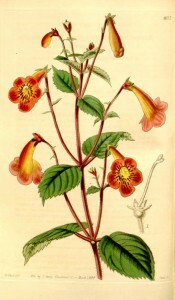 It has too the thin soft foliage of Achimenes instead of the thick coarse leaves of a Gesnera. In a cultivated state the appearance of this species is much improved. The wild specimens have larger leaves and smaller flowers, and look like drawn up plants pulled out of a thicket where they had been struggling with darkness and a scanty soil for their existence. In the hothouse the flowers are more numerous, larger, and of a peculiarly deep scarlet, richly marked with rows of crimson spots. It is a good addition to collections.’ [BR f.31/1842]. The Gardeners' Chronicle gave it an enthusiastic review in 1844: ‘The soft and exquisite light purple of the blossoms of A. longiflora and the glowing crimson-scarlet of A. coccinea have here a worthy companion in the deep vermilion and orange of A. pedunculata.’ FC p.146/1842. MB p.271/1843. BM t.4077/1843. Listed in the 1845, 1850 and 1857 catalogues [B.13/1845]. Probably obtained from Loddiges’ Nursery, either in a case of plants brought back by Bidwill or in a direct importation in late 1844. Concerning the latter Macarthur wrote on 6th January 1845 that he now had Achimenes. [MP A2933-2 p.28]. He wrote to Bidwill on 25th November 1845: ‘Achimenes coccinea, pedunculata and grandiflora have flowered beautifully, particularly A. pedunculata which was covered with its beautiful blue flowers during at least 3 months.’ [MP A2933-2 p.98]. Macarthur here describes its flowers as blue, presumably a mistake on his part or on the part of his supplier. Also obtained from Kew Gardens, brought out from England by Captain P. P. King in 1849. In the confirmatory list sent by Macarthur to King it is marked with an ‘x’, meaning common before or long introduced. [ML A1980-3].